In Maine back in the mid 1950’s our family of 10 ate well on $20 a week for groceries. A highlight after the weekly food shopping was watching 8 kids battle for the cereal box prize. A Roy Rogers or Flash Gordon ring would be priceless today, yet other quality plastic toys were popular magnets for various brands. The television ads with free toys often enticed kids to campaign for that cereal. 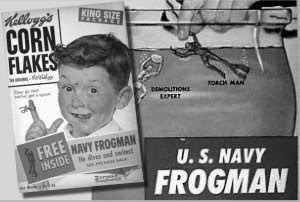 The Navy frogman toy provided a lesson in chemistry once you filled one end with baking soda and dropped it into the kitchen sink or bathtub. Moments later the frogman would magically swim to the surface behind a trail of bubbles. Well, not always. Kids are impatient, so when moments turned into minutes the duds were retrieved, repacked with fresh baking soda, and launched again. Higher quality cereal box offers required clipping multiple proofs of purchase, and then mailing away for your prize. Some required payment of 25 cents to a dollar, and then waiting 6-8 weeks for delivery, so nothing could beat those free in the box prizes for instant gratification.